This used to be a nice place for a walk. Now you cannot pass through. 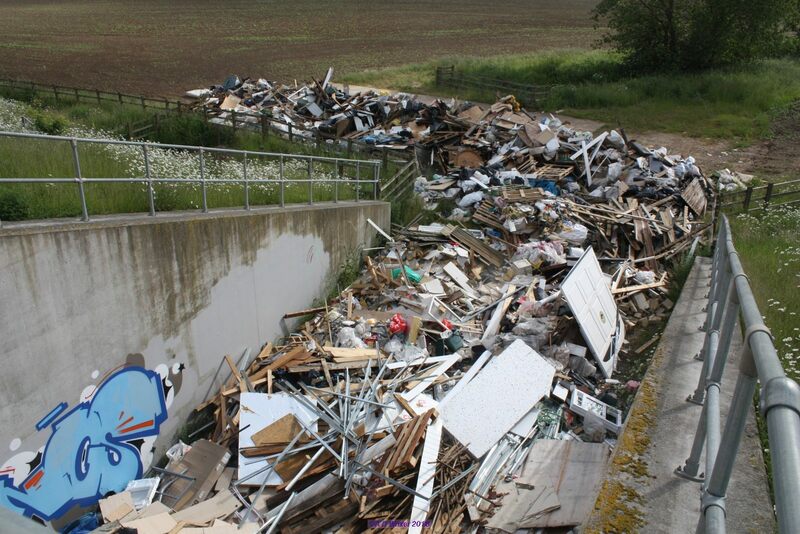 Beneath Britain's busiest motorway, the M1, through delightful rural Bedfordshire, this amazing pile of rubbish was deposited over a 2 week period that ended on 5th June with travellers being evicted from the site. The site entrance was subsequently guarded by security with dogs on that Tuesday afternoon. Persons from the travelling fraternity entered Highways England land at motorway junction M1, at Toddington. For almost two weeks caravans were illegally encamped on Highways England property. 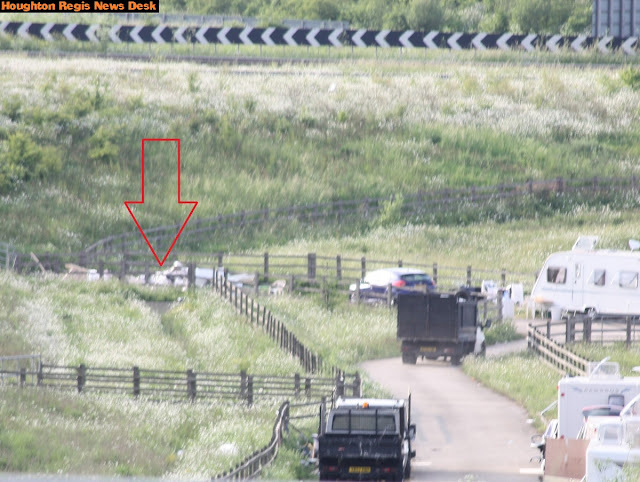 As was witnessed on Friday, 1st June, tipper truck after tipper truck arrived and entered through a locked gate managed by the travelling community and went on to deposit rubbish in the footpath tunnels that burrow under the M1 motorway. The tunnels form part of public footpath FP34, Toddington towards Harlington. See map. Rubbish seen here is piled up on the western side of the pedestrian underpass, effectively preventing public access. Section 61 section powers could have been used on 1st June, according to Central Bedfordshire Council, as the land had been illegally occupied and they could have been forcefully evicted. But in a statement read out on BBC Three Counties Radio on 6th June, the county police force said Section 61 section powers were not felt to be appropriate based on the assessment of the circumstances. Bedfordshire Police said they understand the impact on local residents and they do work closely with partners like the local authority and the Environment Agency. The statement also said that a review would be undertaken on the decision made last Friday. 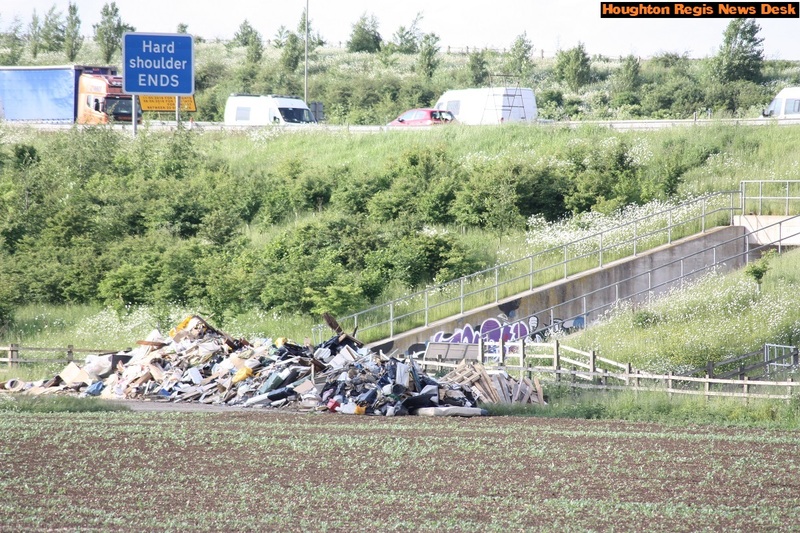 Rubbish (arrowed) was here seen piled up on the eastern side of the M1. 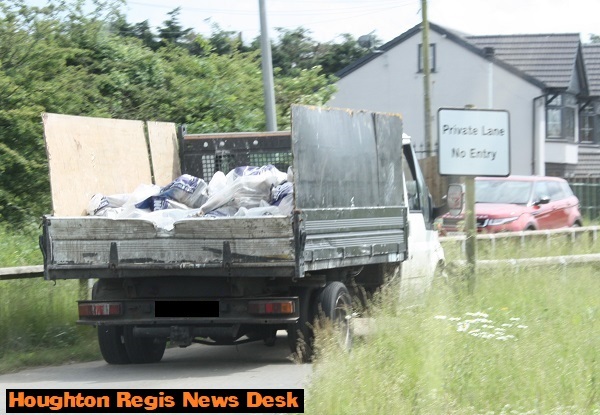 A similar fly-tip at the same location took place last year and was captured in the News Desk Video below. The cost of that clear up was put at £40,000. 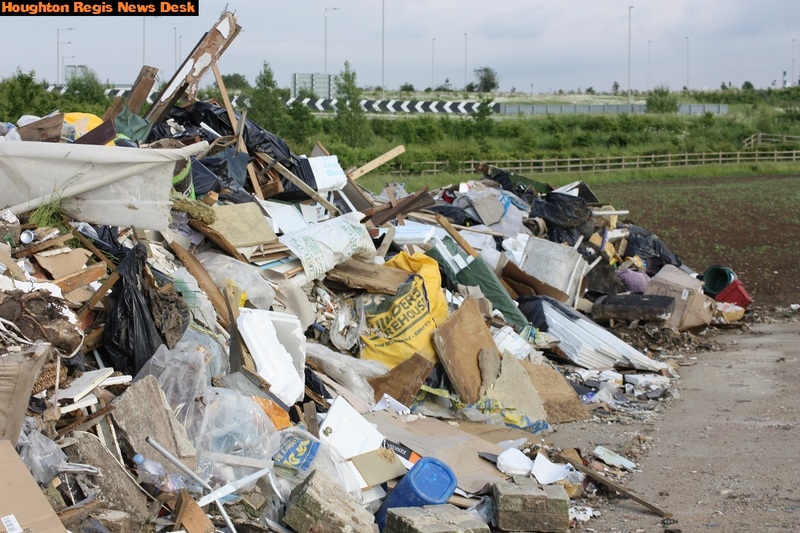 It is understood that the amount of rubbish this time may be as much as three times the amount dumped in last year's fly-tip and that there could be as much as 500 tonnes. 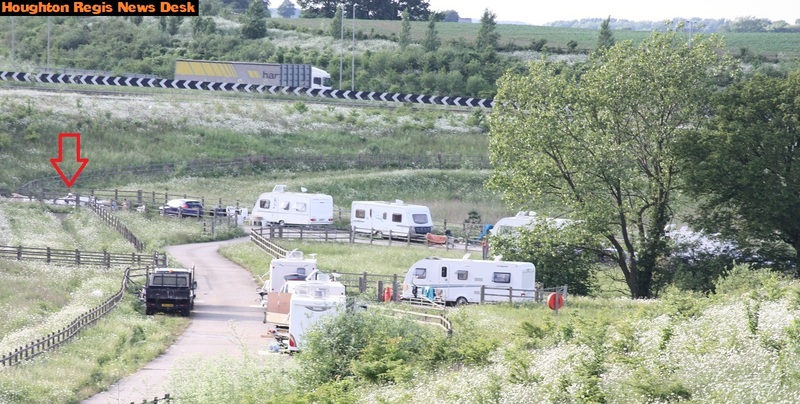 Councils, police, and private landowners have various powers to deal with travellers. Read this file from Gov.uk (pdf). 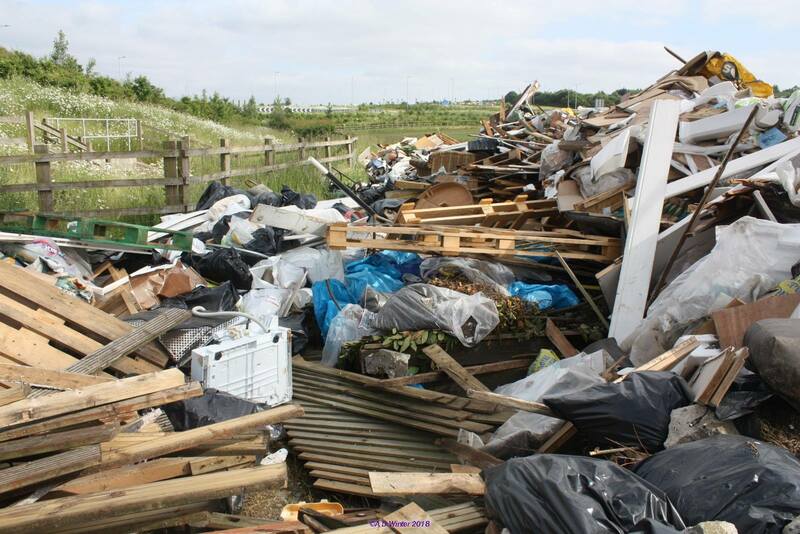 to investigate such incidents on private land, but have no obligation to clear fly-tipped waste. It is unlikely that the Environment Agency will clear the waste, although it may provide other assistance or advice if the environment or human health is under threat. 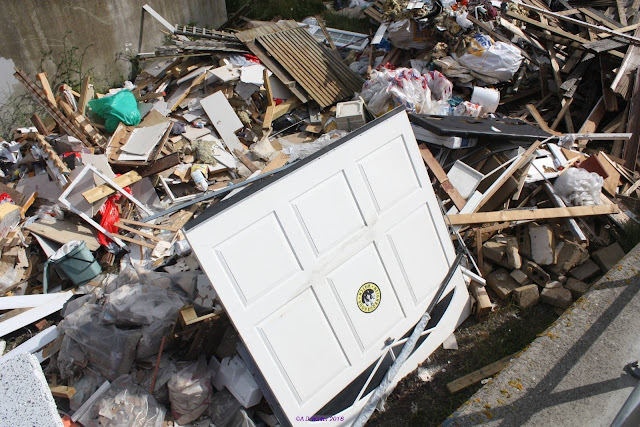 Recent case law has shown that in some circumstances, landowners may become liable for “knowingly permitting” unlawful waste activities if they fail to address them. "